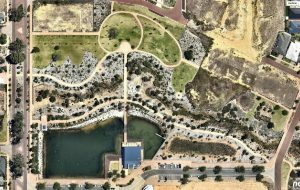 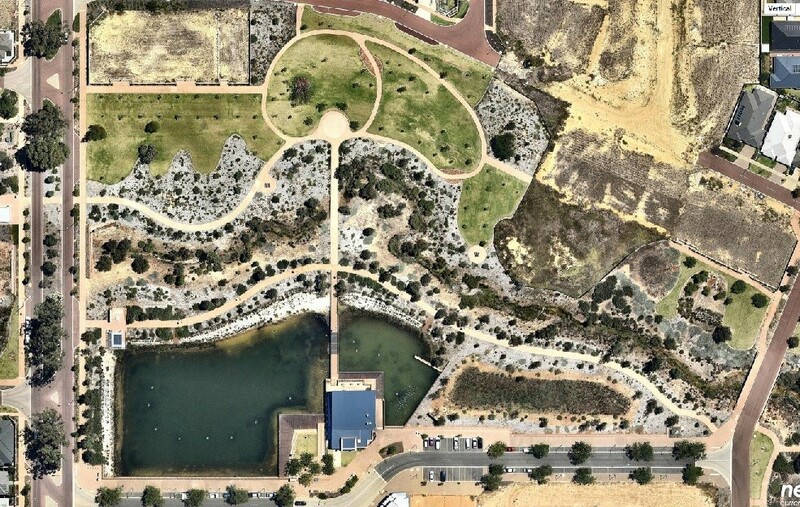 Following community reports of introduced fish in the water, Terrestrial Ecosystems undertook a survey of two artificial lakes which were constructed in a residential subdivision in Byford, Western Australia (Plate 1) to determine if they contained non-native or introduced fish. 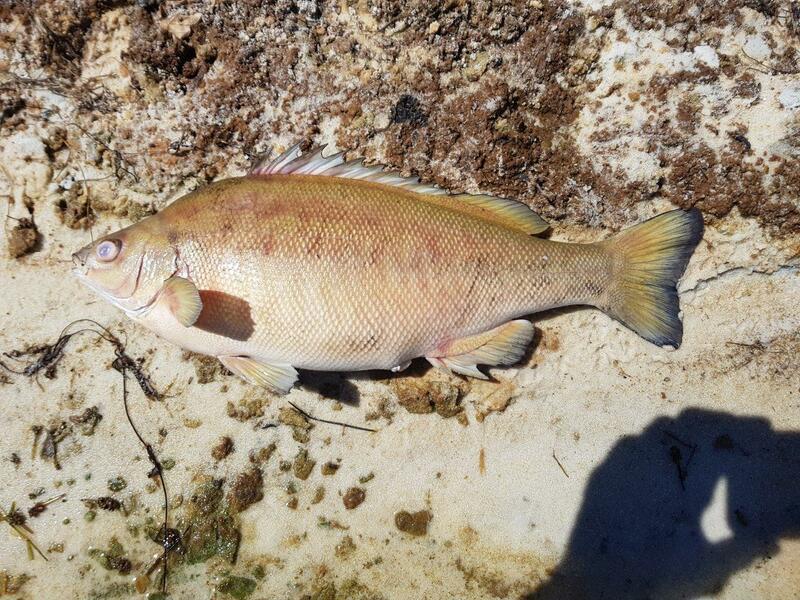 Pearl Cichlids (Geophagus brasiliensis) and Mosquitofish (Gambusia holbrooki) were both recorded in high densities during the fish survey program; both fish species are non-native and the Mosquitofish is on the Noxious Fish list issued by the Fisheries Branch of the Department of Primary Industries and Regional Development. 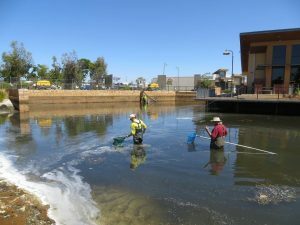 Mosquitofish are now widespread in Western Australian waterways and unlikely to ever be eradicated, however, the Pearl Cichlid has a very limited distribution and because of its potential significant impact on native fish fauna, should be eradicated from lake systems before it is able to spread. 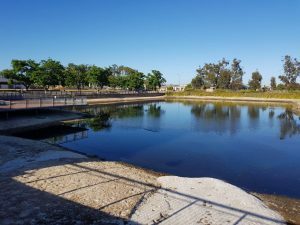 Due to the proximity of nearby drains and overflow points, fish contained in this artificial lake system had the potential to spread to the Serpentine River catchment if left unmanaged. 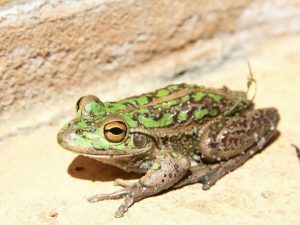 Approval was obtained from the Australian Pesticides and Veterinary Medicines Authority (APVMA) to use rotenone to eradicate the feral fish species. 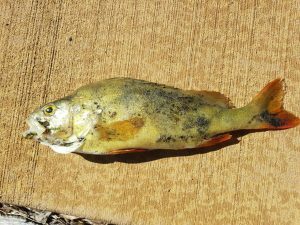 To kill all feral fish, it was necessary that a low dose (0.25ppm) of rotenone was mixed evenly though the water column. 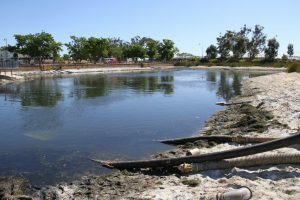 If one or two small pockets of water were left untreated a few fish may have survived to breed and the program would not be successful. 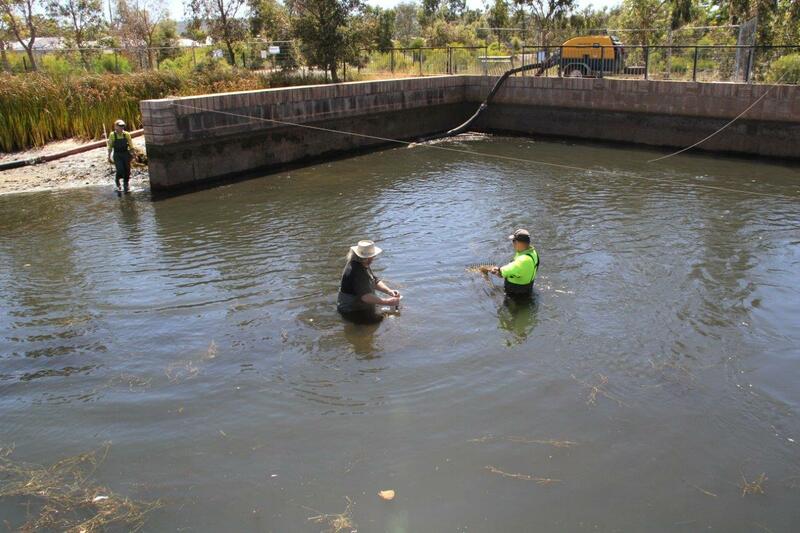 The water level in the lakes was lowered so each lake was approximately one metre deep (i.e. 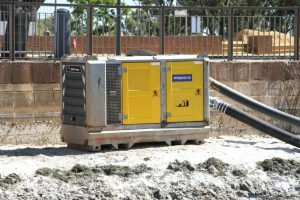 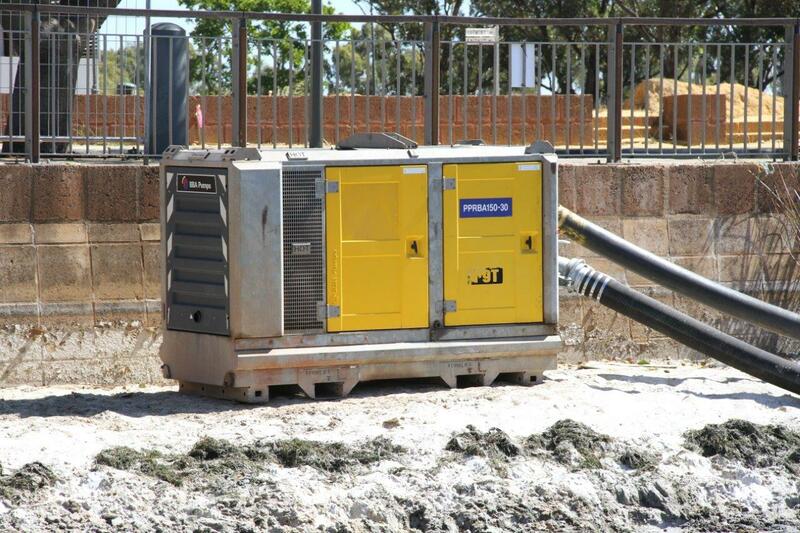 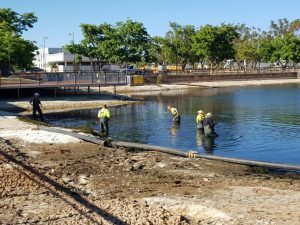 water volume ~1,000m3 for the top lake and 3,200m3 for the lower lake), most of the floating vegetation was removed and Pumps United was engaged to provide a pumping solution that resulted in the circulation of water in both lake systems. On 26 November 2018, five BA150 pumps that have a capacity to pump ~130L/sec., (three pumps in the lower lake and two in the upper lake) were installed to achieve an even distribution of rotenone in both water bodies. 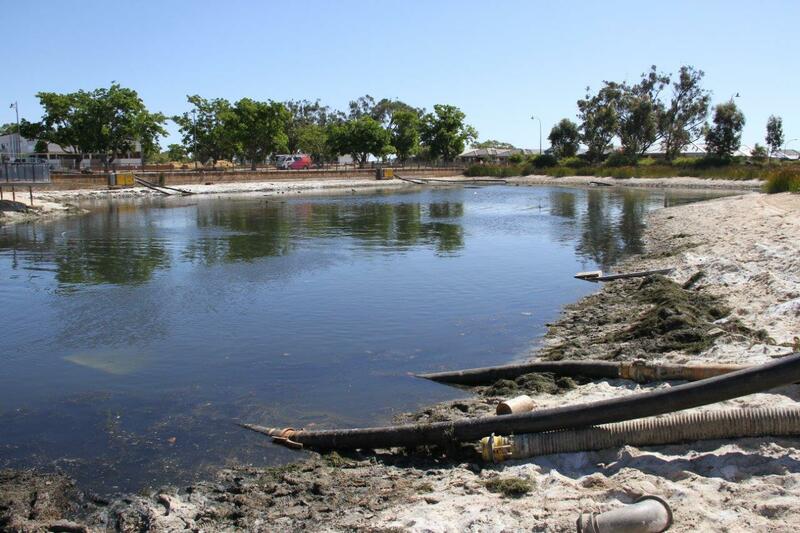 On 27 November rotenone was injected through the pump network so that it was spread quickly and evenly. 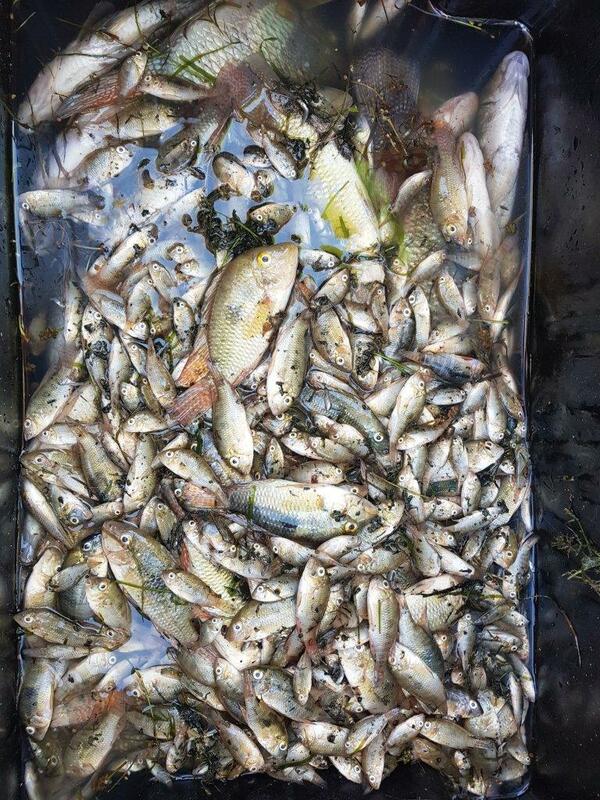 Within 15mins fish were dying and starting to float on the surface. All floating fish were recovered daily for a week and some fish died and sank to the bottom which were consumed by the tortoises, yabbies and wetland birds. 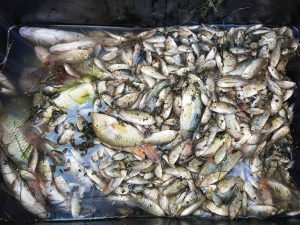 Approximately 1,700 Pearl Cichlids died, floated to the surface and were removed from the lakes, along with a very large (>5000), but uncounted number, of Mosquitofish. 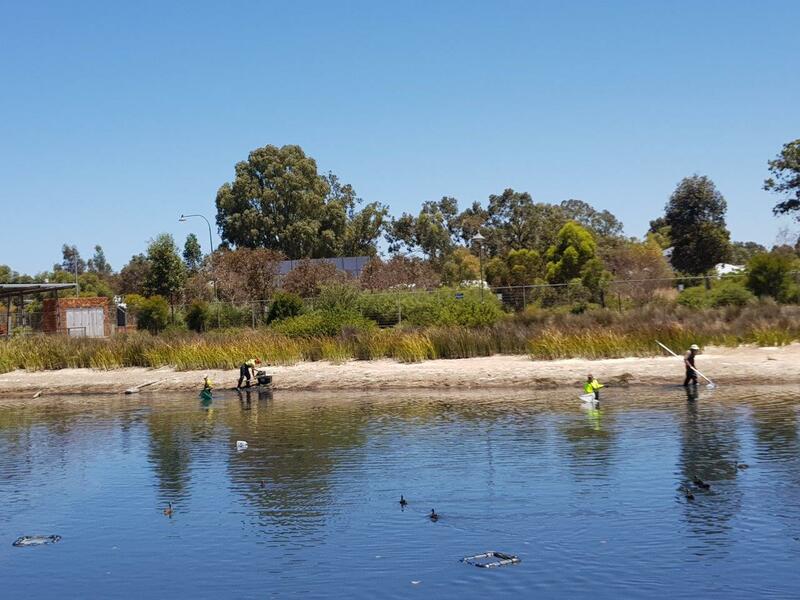 In addition, one large Goldfish, Redfin Perch, one large Eel-tailed Catfish and a Silver Perch were removed on the day. 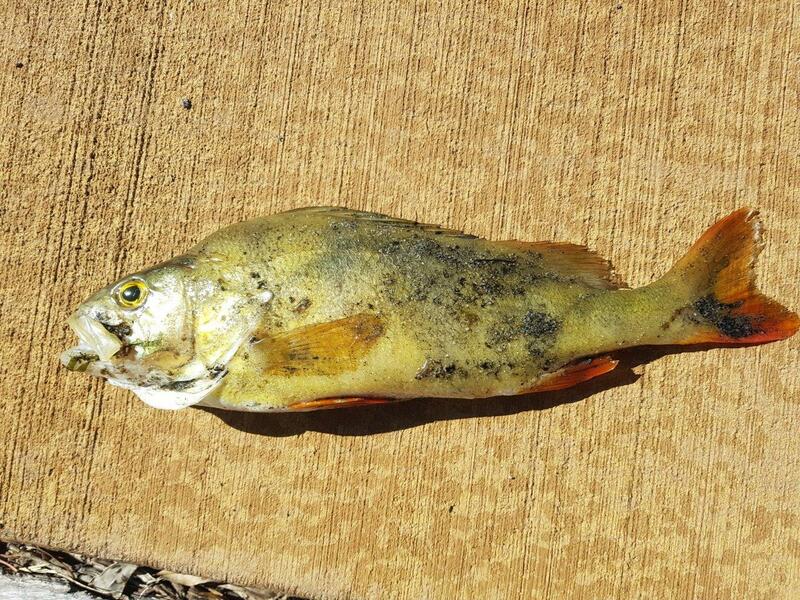 We estimated that only about 25% of fish floated to the surface. 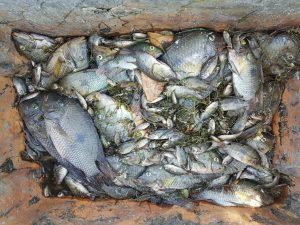 A Silver Perch, multiple Pearl Cichlids and Redfin Perch were removed on subsequent days. No live fish were observed during visits to the lakes between 28 November and 5 December 2018 and no live fish were caught in the subsequent monitoring events using Fyke nets, fish traps or seine netting. 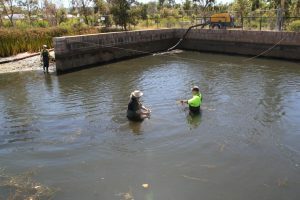 The monitoring surveys caught 19 large yabbies in the baited fish traps and numerous Motorbike Frogs (Litoria mooreii) were recorded around the lake indicating that they had survived the injection of rotenone and fish kill. 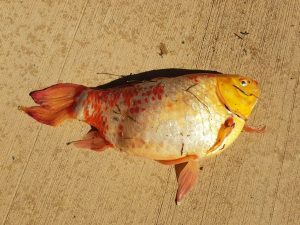 The number of fish-eating birds (i.e. 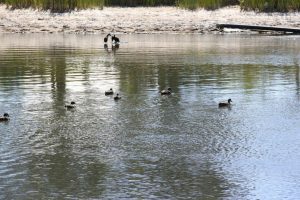 ducks, cormorants etc) also increased over the subsequent week due to the availability of easily caught food; no sick or dead birds were recorded. The monitoring program will continue for 12 months to confirm that no introduced fish remain in the lake system. 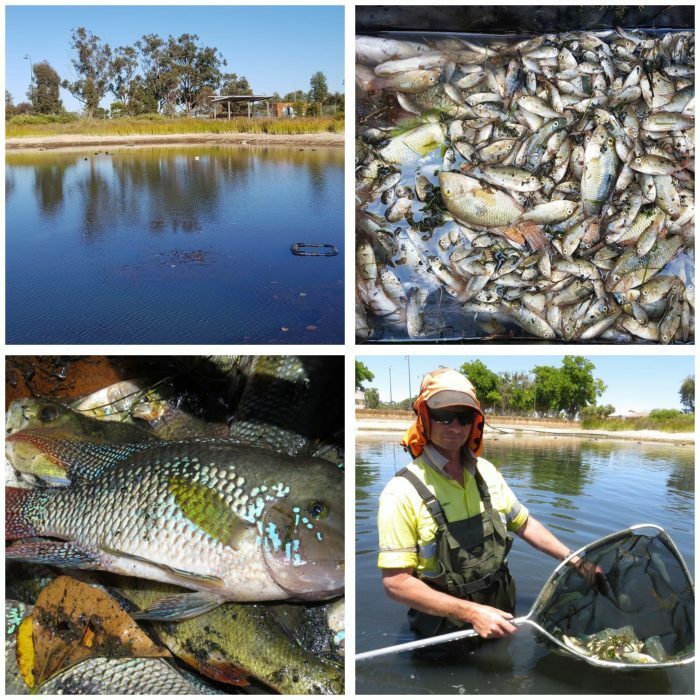 At the conclusion of the monitoring the lakes will be restocked with native fish. 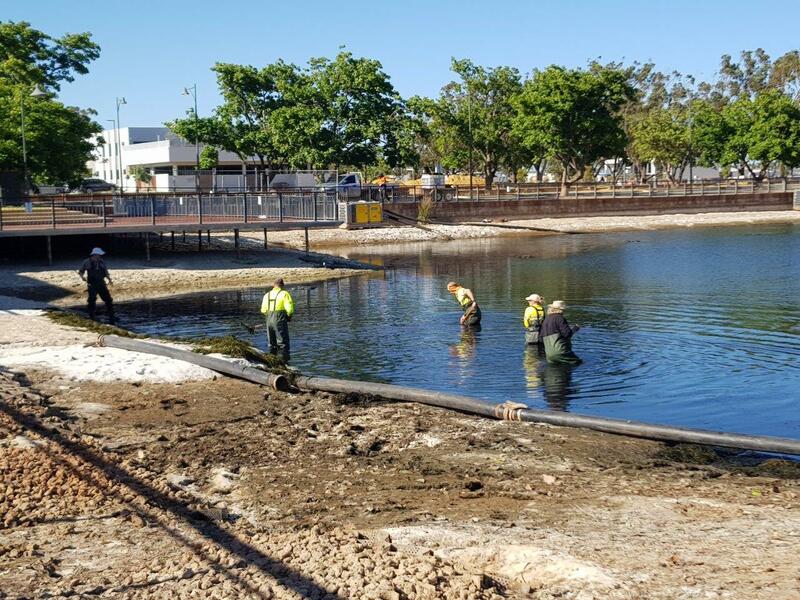 This is the first time a complete lake system has been successfully eradicated of introduced fish species for a developer and shows that with adequate planning, community consultation and integration of relevant expert teams a potential biodiversity disaster has been avoided. Some images of the lakes, equipment and dead fish that were removed are provided in Plates 1-14. 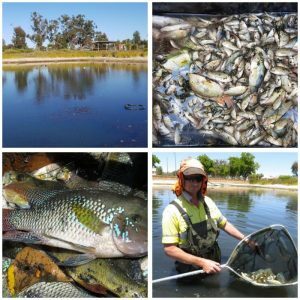 If you are aware of waterways containing feral fish, don’t hesitate to contact Terrestrial Ecosystems so that appropriate management programs can be put in place to reduce the risk of the feral fish spreading into natural waterways.